Once a tree has been removed, the stump left behind may need to be removed as well. Often, once the bulk of the tree is gone the stump will decompose and return its nutrients to the soil. However, this can take a great deal of time while leaving you with a useless and unsightly stump to deal with. As part of our Tree Removal service, Advance Tree Service Inc. can grind and remove the stump with our specialized stump grinding equipment. At your request, a Advance Tree Service, Inc. I.S.A. Certified Arborist will include our Stump Grinding and Removal service in your estimate for tree removal. STUMP GRINDING AND REMOVAL F.A.Q. Q: Why Should A Stump Be Removed? A: Typically, a stump is removed for aesthetic reasons after the tree has been removed. However, some trees are removed due to decay, pest or disease infestation, which will be present in the stump as well. Removing the stump will remove the potential for spreading those pests or diseases to your remaining trees. Stumps left on your property can also harbor stinging insects and termites, which can present a hazard to your family and your property. 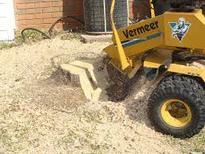 Q: What Are The Benefits To Stump Grinding And Mulching? A: Stump grinding is an efficient and effective method of removing a stump without the need for larger digging machines such as a backhoe. Our stump grinders are small enough to access most areas on your property, and will not leave you with a large hole in the ground after the stump is gone. For healthy trees being removed, the mulch created by the ground stump can be left in place to return its nutrients to the soil and help fertilize neighboring plants. Q: How Does Advance Tree Service, Inc. Grind And Remove A Stump? A: Advance Tree Service, Inc. operates a variety of stump grinding equipment to suit the size of the stump and the access requirements of your property. The stump grinder will quickly and effectively grind the stump into mulch that will be removed with the rest of the tree material. For the stumps of healthy trees, the mulch can be left behind for organic composting or ground cover.